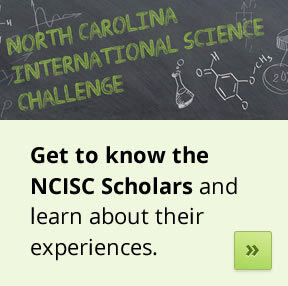 The North Carolina International Science Challenge (NCISC) is a yearly North Carolina STEM competition for high school students. The selected students travel to Beijing, China to present their STEM research projects at the Beijing Youth Science Creation Competition the third week of March. The competition requires students to undertake a STEM research or Maker project, write an abstract explaining their research problem and present their research to a panel of scientists and engineers. The students selected spend a week in Beijing presenting their research, meeting students from other countries, and experiencing various cultural and scientific events. The NCISC is offered jointly by the North Carolina Science, Mathematics and Technology Education Center (SMT Center) and the Morehead Planetarium and Science Center. A major purpose of the NCISC is to encourage excellent STEM projects. The project components are consistent with graduation project requirements and students should consider combining these two programs. “STEM project” is defined broadly and can be an investigation in any of the STEM areas: Science (physical or life), Technology, Engineering or Mathematics. It may be empirical (controlled experiment) or might incorporate another design: for example, analytical or construction-based.